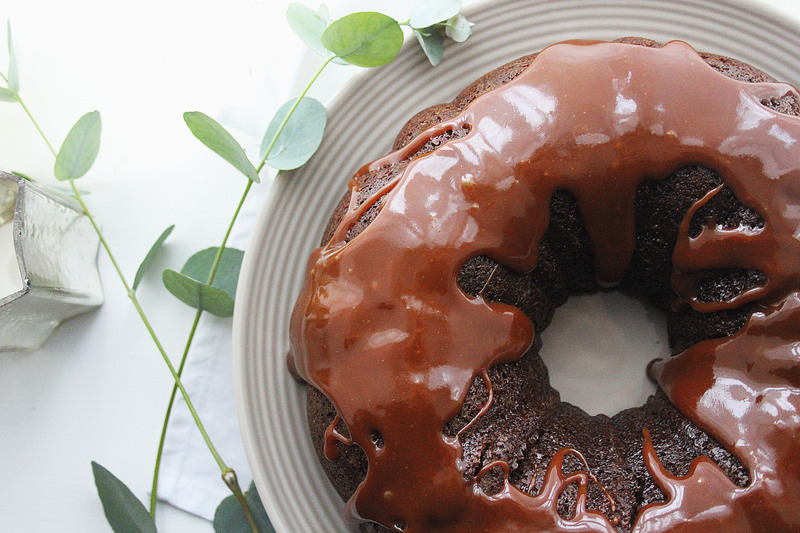 This Autumnal bundt cake, inspired by the humble toffee apple, is perfect for feeding a bonfire night crowd; it’s easy to make, packed with flavour and can be enjoyed hot with ice cream or cold alongside your post-fireworks drink. Preheat the oven to 170c. 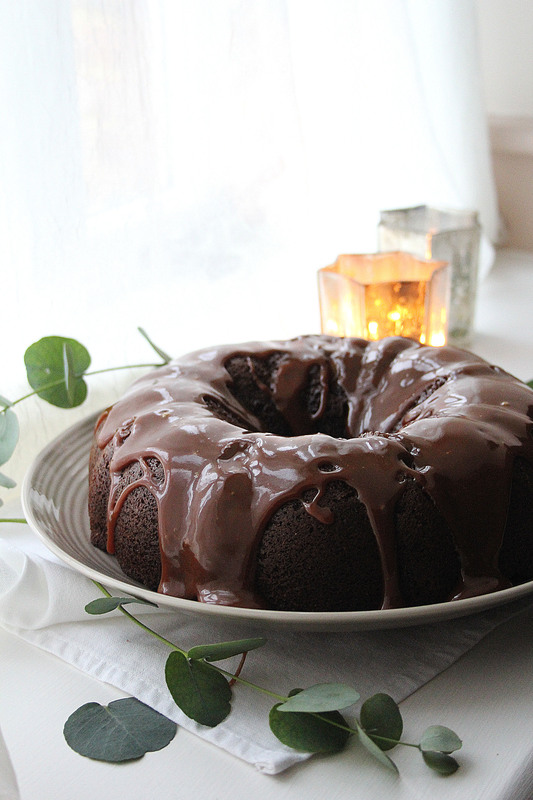 Grease a 22cm bundt tin (or 20cm square tin) with butter then dust with plain flour and tap off the excess. Set aside. For the gingerbread place the butter, sugar, syrup, treacle, stem ginger and spices in a large saucepan over a medium heat. Melt the ingredients together, stirring occasionally, until you have a smooth liquid. Set aside to cool for 5 minutes then stir in the milk and eggs. In a large bowl briefly stir the bicarbonate of soda and flour to combine. Add in the warm liquid and beat until you have a smooth batter (this should only take a minute or so- I do it by hand). Finally, add the chopped apples and briefly stir, then scrape the batter into the prepared tin and bake for 35-45 minutes until a skewer comes out clean with a few moist crumbs attached. 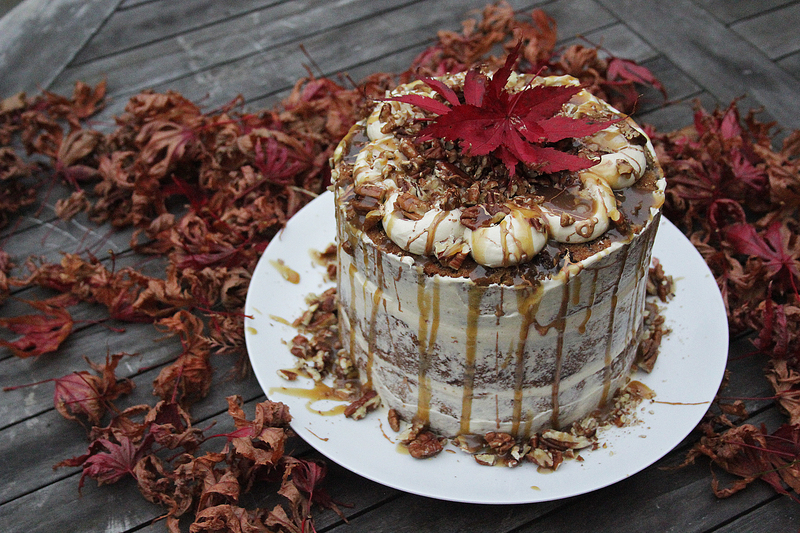 Leave the cake in the tin for 10 minutes to cool a little while you make the caramel. For the caramel just pop the water and sugar in a saucepan and heat gently until the sugar dissolves (do not let it boil and do not stir it at this stage). Once the sugar has dissolved up the heat and boil the syrup until it reaches a deep golden colour, then add in the cream, salt and rum and stir (it will spit a little but don’t worry, just watch your hands!). Set aside once your caramel is smooth and lump free. 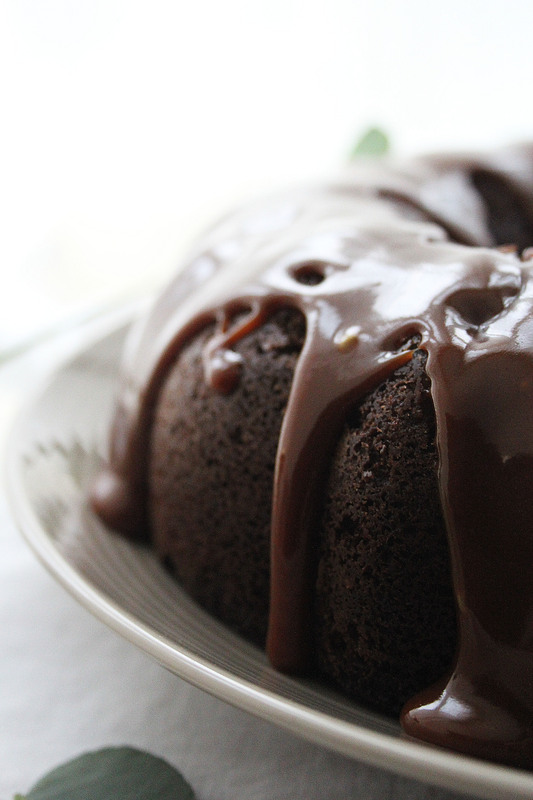 Now turn out your bundt cake (it will still be warm) and prick it all over with a skewer. Pour over most of the caramel, allowing it to sink into the holes. 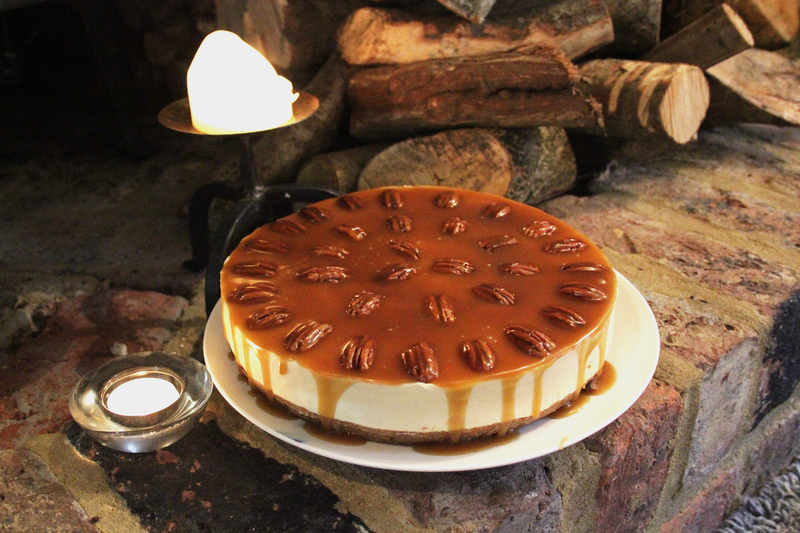 Serve with ice cream and any leftover caramel. 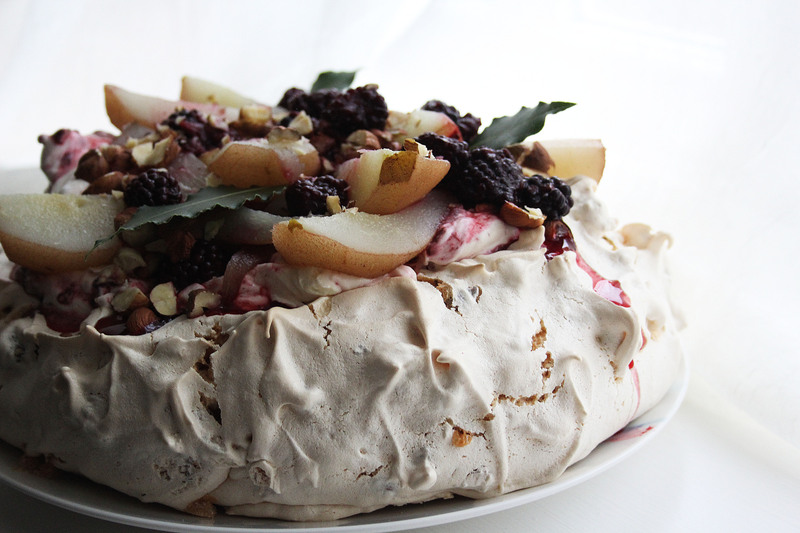 This pavlova screams Autumn; each element contains a seasonal hero and I definitely (big statement) prefer the combination of hazelnut meringue, blackberry cream and bay poached pears over the classic summer berry meringue we all know and love here in England. 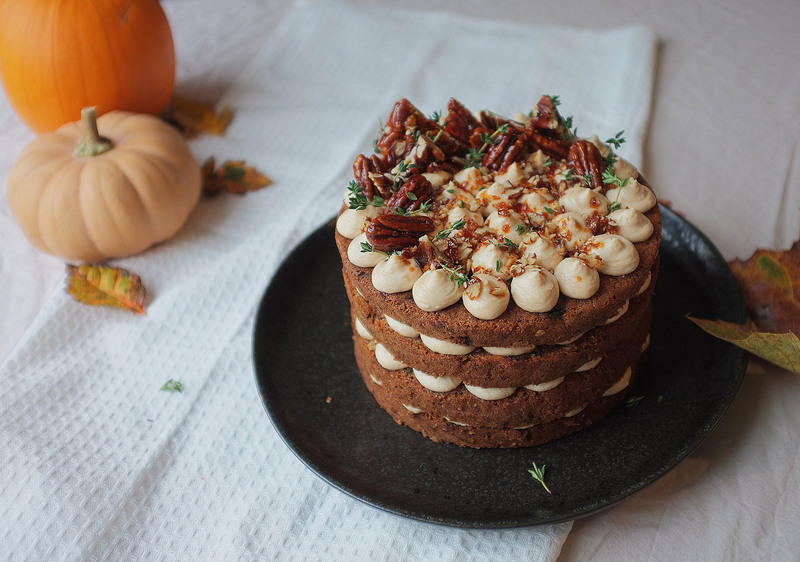 Make it for an Autumn gathering (or dare I say it- Christmas) and it is sure to be a crowd pleaser. Preheat the oven to 130c and line a large baking tray with greaseproof paper. To start, make the pavlova. To do this place the egg whites in a large clean bowl (or bowl of a stand mixer) and whisk to stiff (but not dry) peaks. Once you reach this stage add the caster sugar 1tbsp at a time and keep whisking until you have a thick, glossy, grain free meringue. Now tip in the cornflour and white wine vinegar and briefly whisk once more to thoroughly combine. Finally, pour 150g of the chopped hazelnuts into the bowl and fold gently with a large metal spoon. Spoon the meringue onto your prepared tray and shape into a rough circle with a dip in the middle. 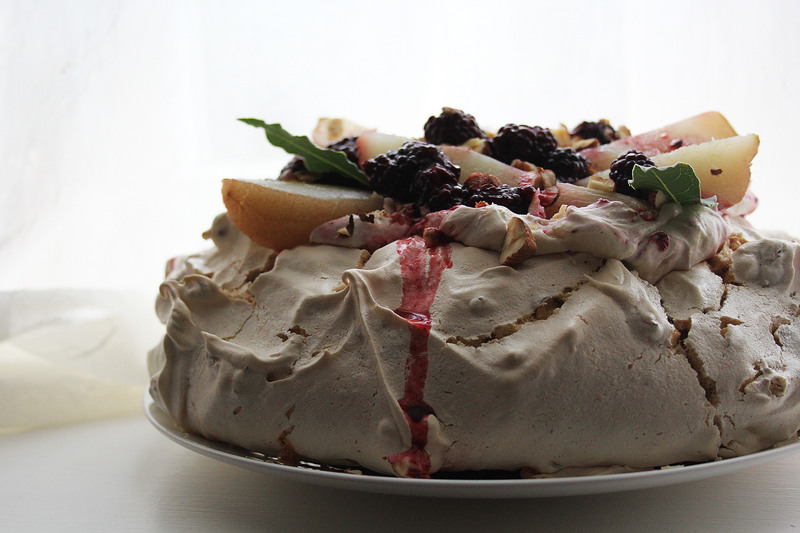 Bake for 1-1 1/2 hours until the pavlova is crisp to the touch and peels away from the paper with ease, then switch off the oven and allow it to cool with the door ajar to avoid any major cracks. While the meringue is cooking and cooling, poach the pears. Pop the peeled pears in a saucepan along with the blackberry rum, vanilla pod, cinnamon stick, bay leaves and caster sugar then top up with water so that the pears are just covered. Simmer for around 25-30 minutes until the pears are tender but not mushy. Once ready, pick out the pears and leave to cool, then return the liquid to the hob, turn up the heat and boil until it reaches a syrupy consistency. Set aside to use later. For the blackberry cream, whisk the cream, icing sugar and vanilla to soft peaks then fold through the defrosted blackberries with a little juice (reserve a few whole ones for decoration). Now you are ready to assemble your pavlova. Put the meringue on a plate or serving platter and fill the dip with the blackberry cream. Pile up the pears on top, sprinkle with the remaining hazelnuts and drizzle over your syrup. Decorate with bay leaves or gold leaf, if you like. Over the past couple of weeks the weather here in UK has regressed to it’s favourite state; dark, cold and foggy. 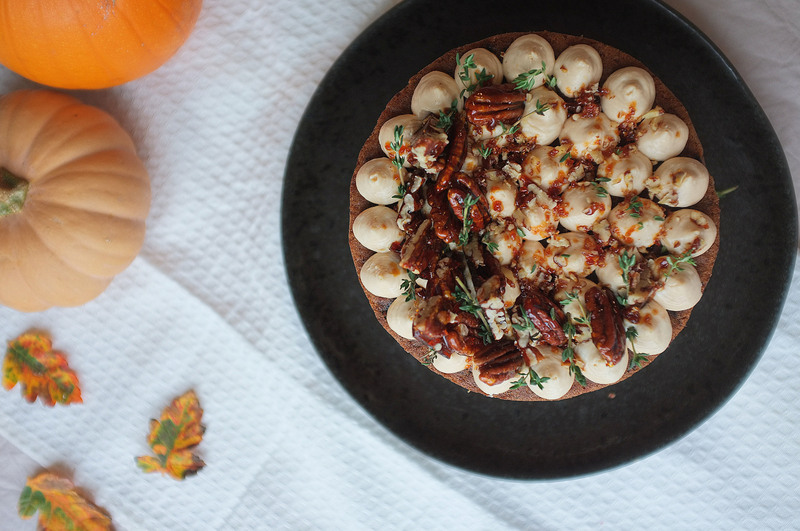 While this sadly means we must mourn the loss of that unseasonably mild Autumn, it also means we have legit excuses to eat some pretty amazing food; think pies, tarts, puddings and roasts. Yes, that miserable UK weather is sounding a lot better now isn’t it? 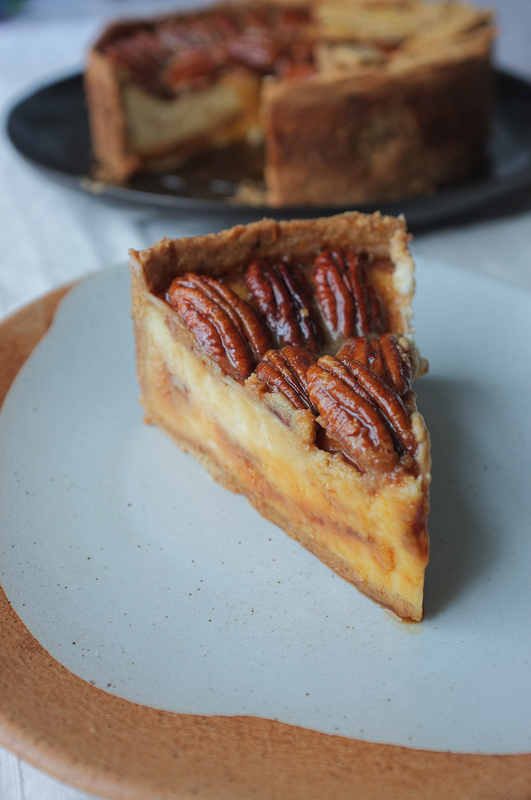 With this in mind, I found myself thinking about lot’s of toffee based bakes on my commute the other day (I know, calm down), and decided I would try out transforming the classic pecan pie into a cheesecake. It turned out really well so here is the recipe! Grease and line a spring form cake tin. For the base of the cheesecake, blitz the biscuits down to a crumb in a food processor. Add the pecans, sugar and cinnamon then blitz again. Once you have a course sandy texture add the melted butter and blitz once more until well combined. Pour into the tin and press down with the back of a spoon. Chill while you make the filling. For the filling, whisk together the cream cheese, vanilla and icing sugar until smooth. 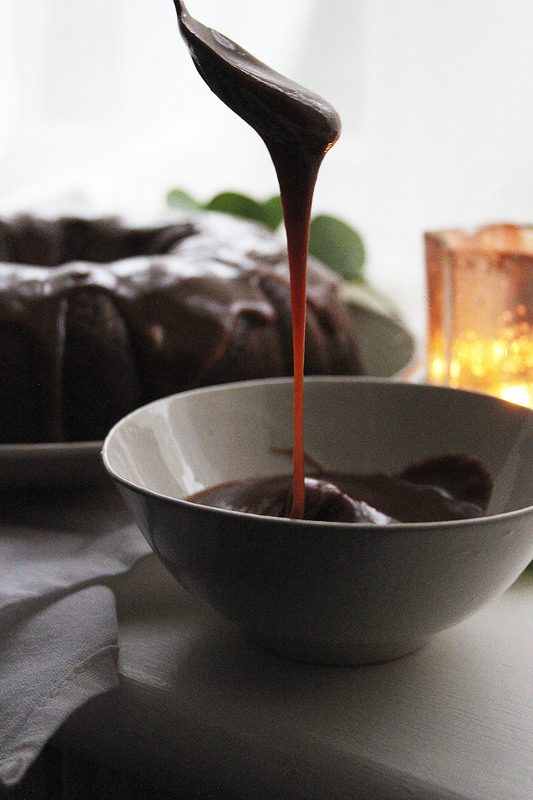 In a separate bowl whisk together the double cream and salted caramel sauce until medium peaks form. Fold the caramel cream into the cream cheese mixture. Once well combined, pile onto the biscuit base and smooth out. Chill for 2 hours (minimum) to set. 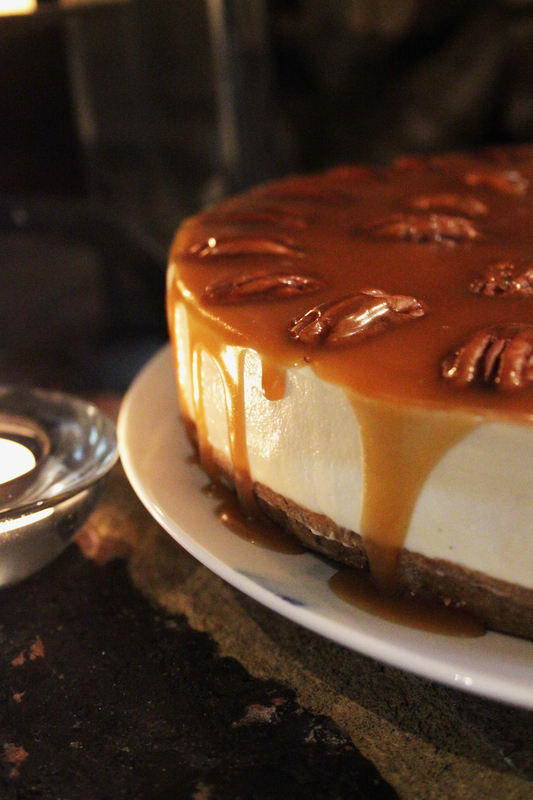 While your cheesecake is setting, prepare the topping. Simply place the maple syrup, brown sugar, butter and salt in a saucepan and melt together. Once melted, bring to the boil and remove from the heat then add the double cream and mix. Set aside to cool. 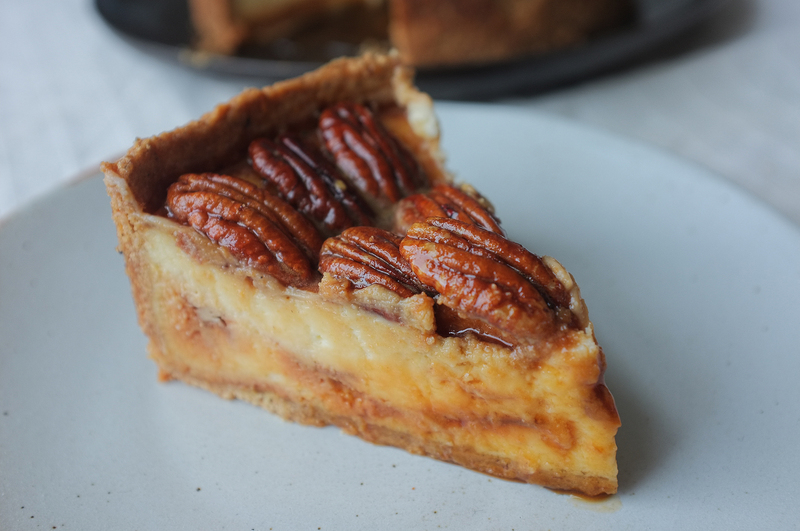 Once the cheesecake is set, arrange the pecans all over the surface (as with a traditional pecan pie). Pour the maple sauce all over the top of the pecans then sprinkle with a final flourish of sea salt. Chill for one hour then slice up and serve. 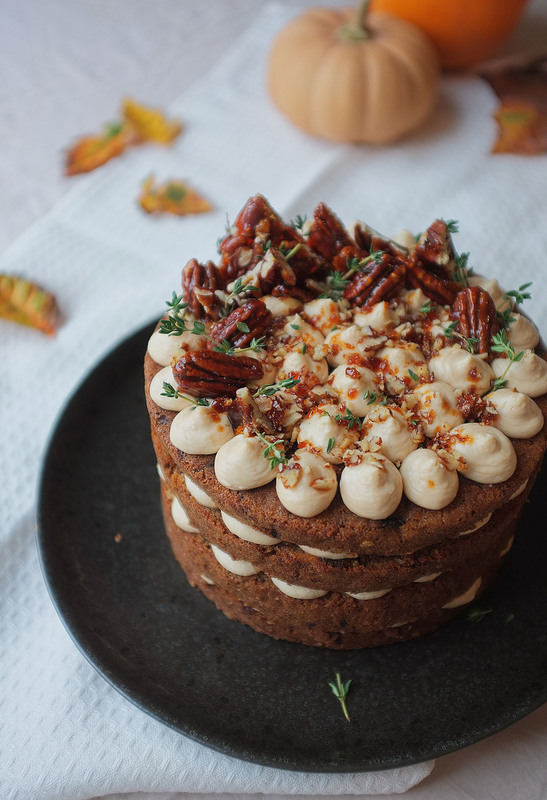 This cake is the ultimate Autumn centre piece- it combines a moist spiced pumpkin sponge with cream cheese frosting, caramel buttercream, pecans and salted toffee sauce; the best flavours of the season! I decorated mine in a really rustic semi-naked style, but you can refine yours to make it a little more formal if you like. Preheat the oven to 170c and grease and line three 7inch cake tins. Place the eggs, sugar, salt and oil in a large bowl then whisk until light and well combined. Sift in the flour, bicarbonate of soda, cinnamon, ginger and nutmeg then gently stir with a spatula until non-streaky and smooth. Now add the sultanas and pumpkin. Mix well and distribute the batter evenly between the three tins. Bake for 30-45 minutes. When a skewer comes out clean when inserted into the cakes, they are done. Once cooked, remove from the tins and cool on a wire rack. 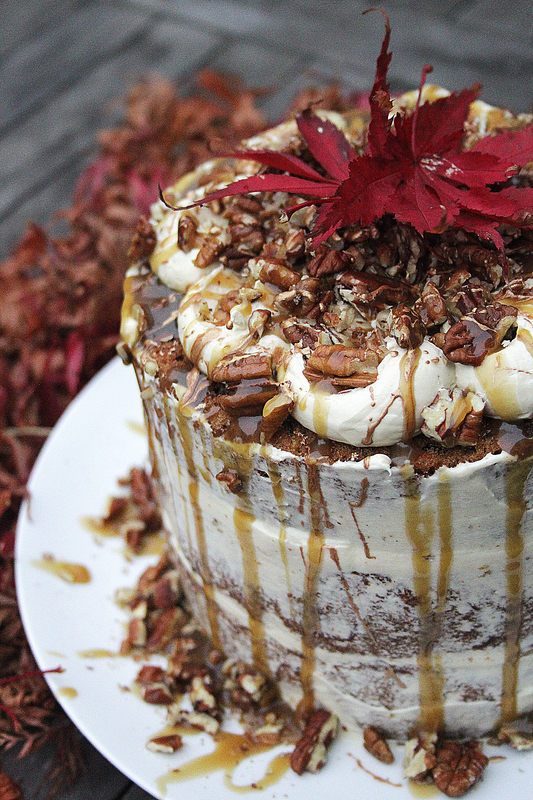 While the cakes are cooling, make the frostings. Start off with the toffee sauce. Place the dark brown sugar, golden syrup and butter in a saucepan and melt together. Once melted, bring to the boil then remove from the heat and add the cream. Stir then set aside to cool. Now make your cream cheese frosting. Whisk the butter with electric beaters or a stand mixer until fluffy, then add the cream cheese and whisk again. Once well combined, gradually add the icing sugar and continue whisking until you have a light frosting. Fold in the vanilla. Once your toffee sauce has cooled you can make the caramel buttercream. Simply beat the butter until really light, then add the icing sugar gradually until you have a simple fluffy buttercream. Finally, add 75g of the toffee sauce and stir through. To assemble the cakes just place one sponge on a plate and pipe a ring of cream cheese frosting round the edge. 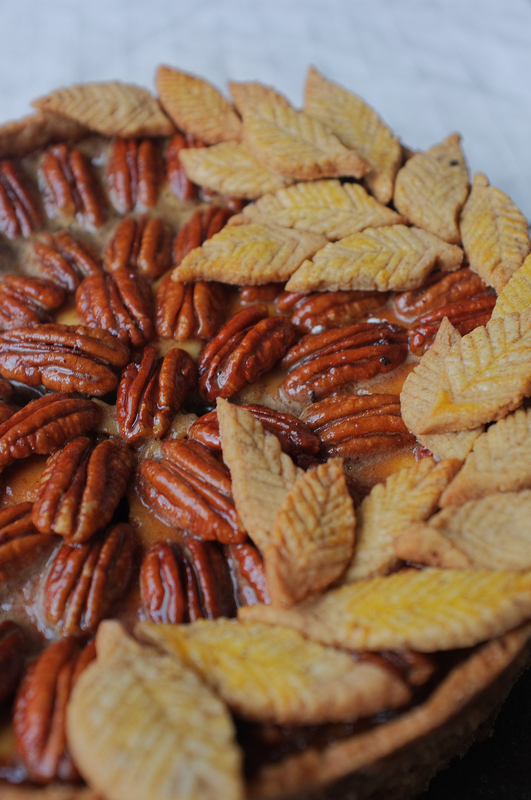 Fill the centre with caramel buttercream and sprinkle over some pecans. Now just top with another layer and repeat until all the cakes are used. Thinly coat the outside of the cake with cream cheese frosting and pipe a design on the top with the caramel buttercream. 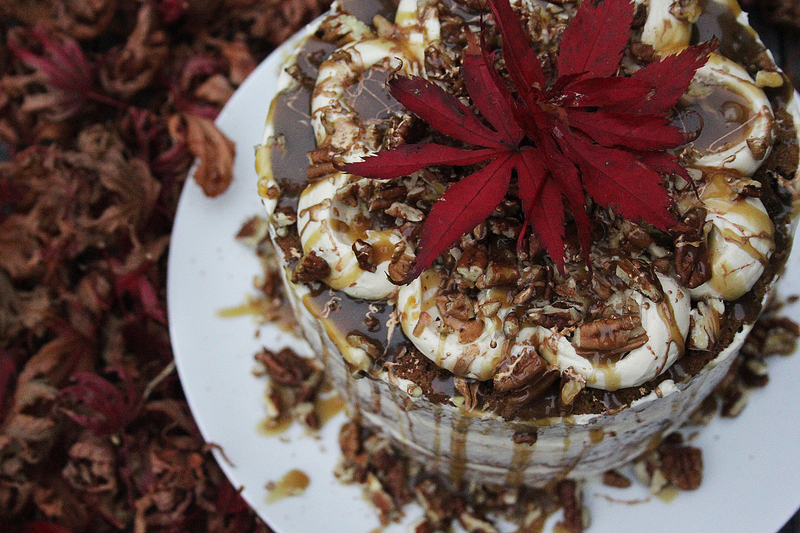 Pile on pecans for decoration and drizzle generously with the remaining toffee sauce. After catching up with last weeks Patisserie round on Bake Off, I decided to whip up my own eclairs using some rhubarb from the garden… What I came up with combines crisp choux pastry filled with stewed rhubarb and a delicious vanilla custard- what’s not to like? First, make the vanilla custard filling. For this you will need: 300ml milk, 2 egg yolks, 50g caster sugar, 1 vanilla pod, 4tsp plain flour, 4tsp cornflour, 300ml double cream (lightly whipped). Mix together your egg yolks, caster sugar and the seeds from the vanilla pod in a bowl. After these are well combined gradually add the flours a little at a time, making sure you mix well between each addition. Now heat your milk in a saucepan until just boiling. Add to the paste-like mix in the bowl and whisk, then return to the saucepan and heat for 3-5 minutes (or until well thickened). If it becomes lumpy, just whisk more vigorously. Transfer to a bowl and cover with clingfilm to avoid a skin forming. After half an hour the custard will become almost set- now you need to stir to loosen then fold in the cream- your filling is now ready for piping! Now prepare the rhubarb element of the filling; you will need: 3 sticks rhubarb, 3tbsp ginger syrup, 4tbsp caster sugar. Heat the oven to 180c (fan). Roughly chop the rhubarb and spread onto a baking tray. Drizzle over the ginger syrup and sprinkle on the caster sugar then cook for 15-20 minutes or until the rhubarb is soft. Using the back of a fork squash the rhubarb and transfer to a bowl. It should be sticky and soft. Leave to cool. For the choux pastry, I followed Paul Hollywood’s basic recipe. You can find that here . To assemble the eclairs, you will need: your choux buns, the vanilla custard, the roasted rhubarb, a sprinkling of ginger, 5tbsp icing sugar with a little water and food dye, and some crystallised ginger for decoration (optional). Slice your choux buns in half horizontally. Take a piping bag and fill with the vanilla custard. Pipe little dots of the filling inside the bottom half of the bun until covered. Now take your rhubarb and place on top of the custard layer (as pictured above). Close the lids on top. Mix the icing sugar with a little water and food dye and drizzle over the tops of the buns for added sweetness, then place a piece of crystallised ginger at one end with a mint leaf as a final flourish. 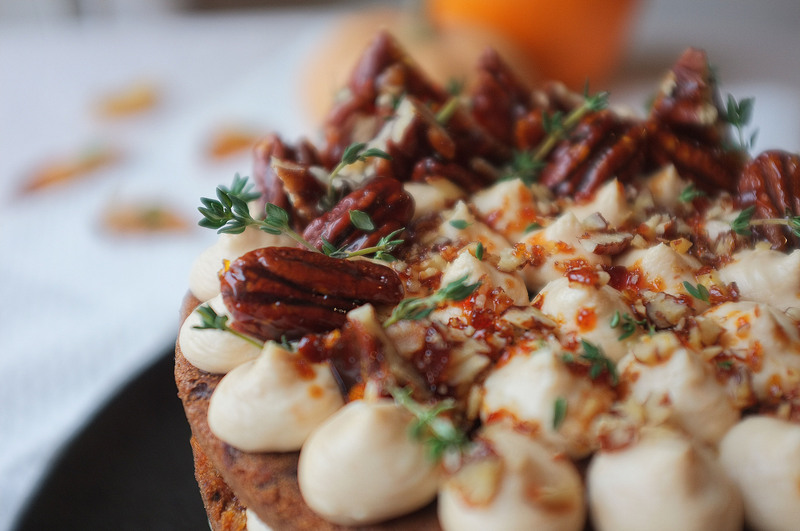 I hope you enjoy this latest recipe!